, a learned divine, was born in the city of Ely in 1562. 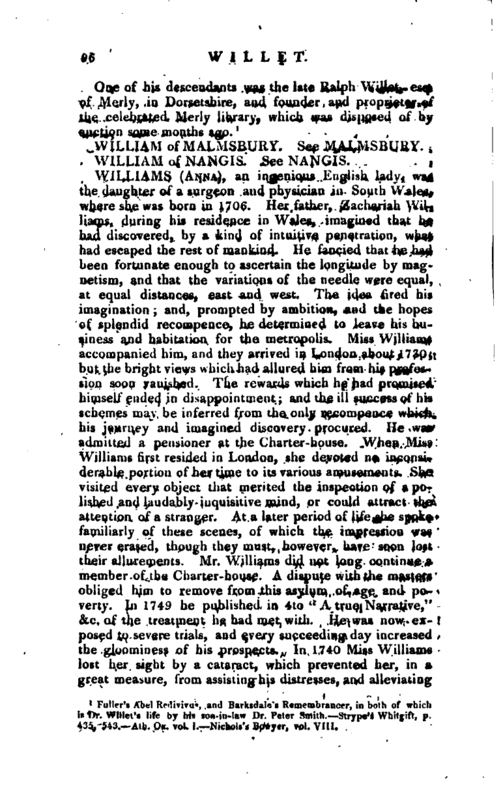 His father, Mr. Thomas Willet, was sub-almoner to Edward VI. and a sufferer during the persecutions in queen Mary’s reign; but in that of queen Elizabeth, was preferred to the rectory of Barley in Hertfordshire, and to a prebend in the church of Ely. His son, who had been a very diligent and successful student while at school, was sent in his fourteenth year to Peter-house, | Cambridge, whence he afterwards removed to Christ’s college, and obtained a fellowship. After passing thirteen years in the university, during which he afforded many proofs of extraordinary application and talents, queen, Elizabeth gave him his father’s prebend in Ely, about 1598, the year his father died. One of his name was also rector of Reed, in Middlesex, in 1613, and of Chishall Parva$ in Essex, in 1620, but it is doubtful whether this was the same person. It seems more certain, however, that he had the rectory of Childerley, in Cambridgeshire, and in 1597 that of Little Grantesden, in the same county, for which he took in exchange the rectory of Barley, vacant by his father’s death. He was also chaplain to prince Henry. About this time he married a relation to Dr. Goad, by whom he had eleven sons and seven daughters. 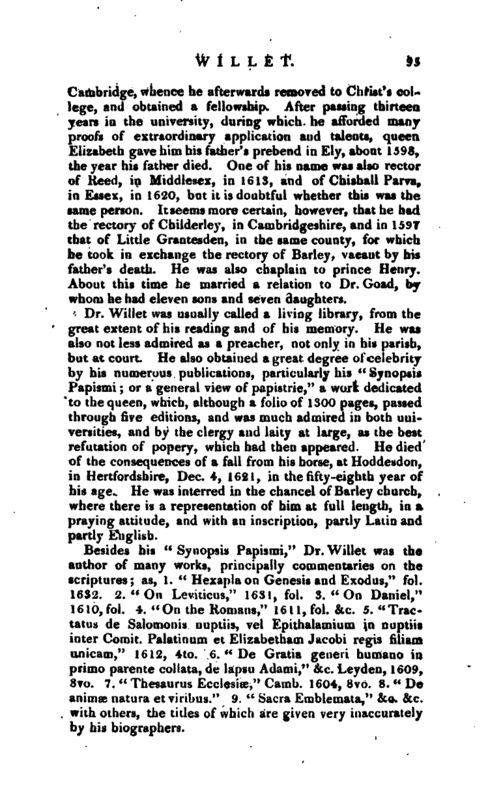 Dr. Willet was usually called a living library, from the great extent of his reading and. of his memory. He was also not less admired as a preacher, not only in his parish, but at court. He also obtained a great, degree of celebrity by his numerous publications, particularly his “Synopsis Papismi; or a general view of papistrie,” a work dedicated to the queen, which, although a folio of 1300 pages, passed through five editions, and was much admired in both universiyes, and by the clergy and laity at large, aa the best refutation of popery, which had then appeared. He died of the consequences of a fall from his horse, at Hoddesdon, in Hertfordshire, Dec. 4, 1621, in the fifty-eighth year of his age. He was interred in the chancel of Barley church, where there is a representation of him at full length, in a praying attitude, and with an inscription, partly Latin and partly English. 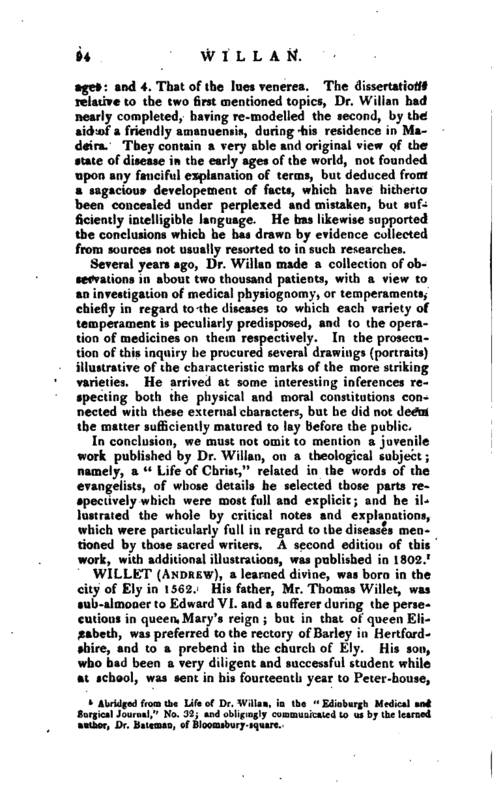 Fuller’s Abel Redivius, and Barksdale’s Remembrancer, in both of which M Dr. Willei’s life by his son-in-law Dr. Peter Smith. —Strype’s Whitgift. p. 435, 543. —Ath. Ox. vol. I. Nichols’s Bowyer, vol. VIII.